Beautiful chairs by SCHREiBER. Collection from TF1. As seen as photos. SET OF SIX DINING CHAIRS. Model:Boston dining chair. Colour: Cream. Material: Faux leather. In photos 5 & 6 there are a couple of marks on the seat back and seat and I have tried to show this. Floor to seat height: 44cm. A matching set of 6 country style light beech wood country style dining chairs. Spindle back style. Dining Chairs Stacking Chair Kitchen Home Office Stackable Chairs Wooden Seat. Condition is Used. Collection in person only. This is for a Matching Set of 6 Queen Anne Style Kitchen/Dining Chairs with Faux Leather/Leatherette Seats. seat pads with sprung bases but easy to remove to re-cover if required. Shaped panel to backs and shaped top rails. The super set of six rosewood kitchen dining chairs. The fabric is a multi coloured floral pattern, overall in good order, there is only one with a minor mark - see pictures. The seat pads are removable for recovering if that is your preference. Condition is Manufacturer refurbished. These chairs were painted with white paint. chairs to the location close to Manchester. you need assistance with the transport so. collection and transport. Width of seat 40 cm. Type:Dining Chair. Room:Kitchen,Dining Room. Soft Touch Faux Leather Upholstered. All goods that are. Black soft leather. Elegant stitching detail that really heightens the designer look and feel of the seat. Here we have a set of Six Danish rosewood Dining chairs. (one seat as a small nick to the cloth Pictured ). the seat and back coverings are used and will benefit from a shampoo or a clean. This set consists of 6 contemporary dining chairs with a simple, yet stylish design, which will make a great addition to your kitchen or dining room. Six individually painted solid beech chairs. Two cornflower blue, two lilac wine, two hessian, each with one contrasting painted leg. 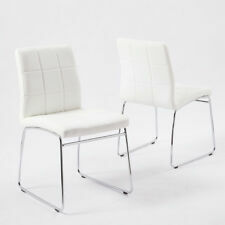 6 used, but in very good condition genuine Vitra Sim chairs in white with felt glides to feet. This flexibility, paired with the generously proportioned seat and back shells in supple plastic, ensures a superb sitting experience. Condition is Used. Being sold due to kitchen remodel. Set of 6 Designer Wooden Kitchen Chairs With Metal Legs. Condition is Used. Collection in person only.